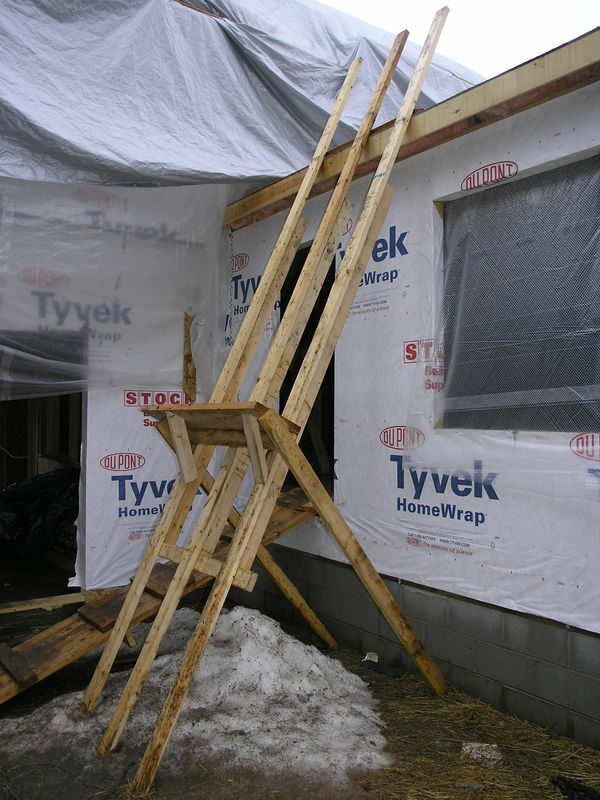 The first couple of pictures is how to get roof sheathing up onto a roof whether working alone or even if you have a helper. This makes it easy and less time consuming. Load up the rack and get up on top to start pulling them into postion as needed. When installing trusses or rafters, Code requires that Seismic and Hurricane Ties be used. One common mistake made by many is the actual placement of such devices. As recommended, all ties should be placed on the exterior of the structure versus what you see here. This prevents any "bumps" when drywall application is done and then crown molding is placed. Depending on the color of paint, these bumps can be noticeable and be quite unattractive, however minor they may seem. It is not considered a Code violation in doing this but I make reference to how it should be done, not how you see it done here. What I have show here is where most install the ties. This is the WRONG way! However, a good builder will install them properly on the exterior of the framed structure.